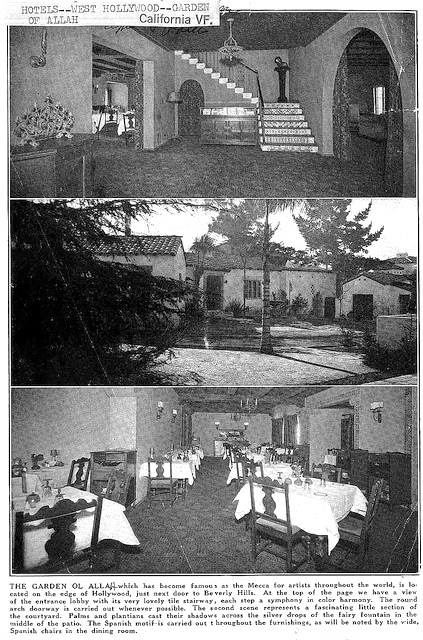 1927 is the year that Alla Nazimova’s Sunset Blvd home opened as a hotel. THE GARDEN OF ALLA – which has become famous as the Mecca for artists throughout the world, is located on the edge of Hollywood, just next door to Beverly Hills. At the top of the page we have a view of the entrance lobby with its very lovely tile stairway, each step a symphony in color harmony. The round arched doorway is carried out wherever possible. The second scene represents a fascinating little section of the courtyard. Palms and plantians cast their shadows across the silver drops of the fairy fountain in the middle of the patio. The Spanish motif is carried out throughout the furnishings, as will be noted by the wide, Spanish chairs in the dining room.